Asha 210, the budget smart phone from Nokia featuring a dedicated Facebook button is now available for pre-order on online portal Flipkart.com for Rs.4499.00. The Asha 210 is a QWERTY keyboard phone and is available in both single and dual SIM models. The one on sale at Flipkart is a dual SIM one with SIM swapping on-the-go. Though it is a budget phone it also has full smart phone features a normal user would yearn for. 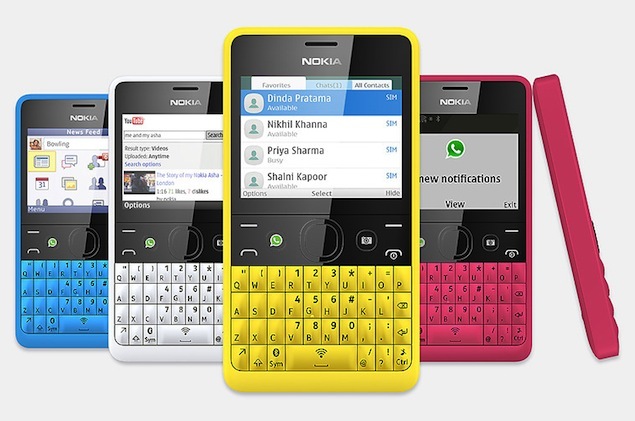 Nokia Asha comes with a 2.4-inch QVGA screen and has 64MB of on-board memory. The storage can be expanded to 32GB by using a microSD card. Asha 210 comes with only a rear 2MP camera with 1600x1200 pixels and can shoot videos in QCIF@10fps. You can edit and share pictures on Asha 210 using native Nokia Slam feature. The Nokia Slam feature uses bluetooth without pairing to let you transfer videos, files and other stuff in addition to the images. Another feature of Asha 210 is that you can shoot pictures even if the keypad is locked with a dedicated hard key for the same. 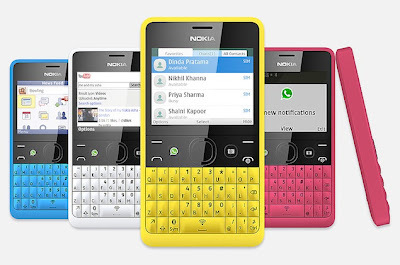 Connectivity wise the Nokia Asha 201 comes bluetooth and wi-fi. It is also equipped with a feature called Nokia Nearby which gives you the details of restaurants, shops and ATM machines in your vicinity. Though a basic budget phone it pack mean rugged Nokia features and can be seen as a best buy for those who always want to remain in touch with their friends and colleagues. IT comes in yellow, cyan, black, magenta and white colours. My only grouse is that Nokia did not pack 3G with this phone. Go to Flipkart now to pre-order the phone which will ship the phone by the 2nd week of July 2013 with a 30 day replacement guarantee and EMI option. Another advantage of Flipkart is that you can get the phone Cash on Delivery.